Matisse is located in the heart of Montrose village at the gateway to the Yarra Valley (1/2 hr drive) and Dandenong Ranges and is in close proximity to many wedding venues and also a perfect location for that romantic getaway within an hour from Melbourne. Matisse is stylish and delightfully decorated with a secret garden gate into the People's Garden at the rear, a fabulous little garden set up by Kevin Heinz, who came to notoriety through the 'Sow What' gardening show on the ABC. Stroll to the local shops where you will find cafes, a bakery & the scrumptious Basil Leaf Thai for dinner. Hahndorf Chocolates is a short stroll away where you can enjoy a delicious afternoon tea - yum! 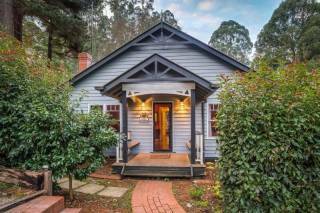 The Villages of Mt Dandenong are just 15 minutes away. Matisse offers the epitomy of Australian back gardens - a wonderful lemon tree, shady trees and a rotary clothes line. In the cottage you will love the double ended soaker tub and gas log fire with marble surround. Matisse is located in the heart of Montrose village at the gateway to the Yarra Valley (1/2 hr drive) and Dandenong Ranges and is in close proximity to many wedding venues and also a perfect location for that romantic getaway within an hour from Melbourne. Matisse is stylish and delightfully decorated with a secret garden gate into the People's Garden at the rear, a fabulous little garden set up by Kevin Heinz, who came to notoriety through the 'Sow What' gardening show on the ABC. Stroll to the local shops where you will find cafes, a bakery & the scrumptious Basil Leaf Thai for dinner. Hahndorf Chocolates is a short stroll away where you can enjoy a delicious afternoon tea - yum! 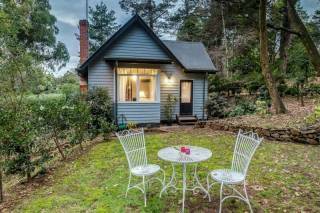 The Villages of Mt Dandenong are just 15 minutes away. Matisse offers the epitomy of Australian back gardens - a wonderful lemon tree, shady trees and a rotary clothes line. In the cottage you will love the double ended soaker tub and gas log fire with marble surround.